(Minghui.org) Falun Gong practitioners participated in the 40th Cabbagetown Festival in downtown Toronto on September 10-11, 2016, after being invited by festival organizers. The event included a grand parade, art performance, and handicraft product exhibition. Over 100,000 people attended the event. The Falun Gong (also known as Falun Dafa) booth had banners with the words “Falun Dafa is Wonderful” and “Stop the Chinese Communist Party’s Live Organ Harvesting.” The Falun Gong practitioners’ yellow T-shirts, Falun Gong books, and small paper-folded lotus flowers at the booth drew the attention of many visitors. Many booth visitors also signed postcards to Prime Minister Justin Trudeau, asking him to raise the issue of Falun Gong during an upcoming meeting with the Chinese Prime Minister on his visit to Canada. The postcards also requested that the Canadian Prime Minister urge his counterpart to stop the persecution of Falun Gong and the Chinese Communist Party’s (CCP) state-sanctioned organ harvesting from living Falun Gong practitioners. Visitors also signed petition forms to Canadian Parliament requesting help in stopping the persecution. Visitors pause to talk with Falun Gong practitioners and learn more about the practice and the CCP’s persecution. Visitors sign the petition at the Falun Gong booth. People from all walks of life signed the petition. Visitors pause to sign the petition no matter rain or shine. The signature collection was warm and touching. Many people signed the postcards, including a candidate for Toronto City Council, the president of a global organization, handicapped persons, and others, young and old. The first day was windy and rainy at times. Despite the weather, many visitors paused to sign the petition at the Falun Gong booth. Some visitors were tearful after listening to practitioners explain the CCP’s live organ harvesting, and they signed the petition right away. Some visitors also asked their family members and friends to sign after signing themselves. Zuhair Syed, candidate for Toronto City Council. He said he would stress the issue in his campaign for the city council and let people know about the human rights violations. He thought the best way to stop the persecution was to let all people around the world know about it. If people don’t know, they can’t do anything. But people who know about the persecution will tell others about it. When all people know the facts, the CCP will have to stop the persecution. Mr. Syed commended the practitioners with a thumbs-up after signing the postcard and petition form. Afewerki Dagnew, president of a global organization. Afewerki Dagnew is president and chief executive officer of a global organization. When passing by, he saw the practitioners distributing flyers of Hard to Believe, a free documentary film about the killing of prisoners of conscience for their organs in China. He left his contact information with a practitioner and asked to keep in touch before departing. Charitable Organization Head: It Is Too Horrible to Save One Person by Killing Another. Dennis Silva, head of a charitable organization. Ontario Merchandiser: I Hope Falun Gong Practitioners in China Will Gain Freedom. Ontario merchandiser Dianne Legault (right) and her friend. Dianne Legault, a merchandiser from Azilda, attended the event with her friend after driving for over three and half hours. They stepped forward to take a look when passing by and seeing the small lotus flowers at the Falun Gong booth. Thu Pham and her daughter. Near the end of the event, Thu Pham, a Vietnamese visitor with her daughter, passed by the Falun Gong booth. She signed the petition form and accepted a flyer. She asked whether Zhuan Falun, the main book of Falun Gong, was available at the booth, as she wanted to buy a copy. A practitioner advised her to buy a copy from the Tianti Bookstore as the practitioners did not have it available in the booth. Thu took a business card for the bookstore and thanked the practitioner. She said she would start practicing Falun Gong after reading the book. (Minghui.org) Canadian Prime Minister Justin Trudeau is about to receive more than 50,000 postcards before his visit to China this September. Each card requests the Prime Minister to bring up China’s human rights violations with Chinese leaders, in the hopes that international pressure will help stop the state-sanctioned organ harvesting from persecuted Falun Gong practitioners. Since July, Falun Gong practitioners in Toronto have been holding activities every day at tourists spots, in the downtown area, and at busy intersections, raising public awareness of the 17-year-long persecution of Falun Gong in China. The brutal persecution has resulted in over 4,000 confirmed deaths (though the number is likely much higher), and possibly more than one million deaths from forced organ harvesting. A major postcard campaign resulted in tens of thousands of signed cards that will be presented to Prime Minister Trudeau. Falun Gong practitioners hold banners to draw public attention to the persecution in China. In the Richmond Hill area on August 4, Falun Gong practitioners collected 200 signatures in just two hours. The practitioners’ signature campaign has received strong support from all walks of life in Toronto. Local resident Steven was shocked by the Chinese regime’s crime of organ harvesting. Johnny Wong, originally from Hong Kong, asked practitioners if he could donate food to them. “I am in the food business, and I really want to support Falun Gong,” he said. “If I broke the law, sure, you could put me in jail. But how can you kill me if I only want to be a good person?” Wong asked, incredulous that a peaceful cultivation practice would be persecuted. Before leaving, Mr. Wong summed up his feelings. “All I want is world peace. I hope the persecution of Falun Gong will stop immediately,” he said. James condemned the forced organ harvesting. He hopes that the Chinese government will respect its citizens’ human rights. Many Canadians believe that Canada needs to speak up about this issue. A number of people who signed postcards said that they would also urge their friends and family members to sign the petition online. Residents of Canada are urged to sign the petition to Prime Minister Justin Trudeau online here. (Minghui.org) Mr. Wang from Liaoning, China, was glad to run into Falun Gong practitioners at the 28th Dragon Boat Festival on Toronto’s Centre Island on June 18 and 19. Mr. Wang had come to Toronto to visit his children. He was about to bicycle around the island and watch the dragon boat games of 160 teams, which attracted more than 100 thousand people. After his bicycle ride, Mr. Wang came back to chat with the practitioners some more. “I am rooted in China, and I believe China has hope. I also believe that Falun Gong practitioners will be able to go back to China soon,” he said before saying good-bye to the practitioners. During the festival, practitioners demonstrated the exercises, set up a photo exhibition, offered free exercise teaching, passed out materials, helped Chinese people to quit the communist party, and collected signatures on petition. Young Falun Gong practitioners are demonstrating the exercises. “Many party members don’t have belief in the party, and we all know the brutality of the persecution,” Mr. Huang said, and gave his card to practitioners to stay in touch. The student then went back to the tree and began reading the book. A few hours later, he came back and asked to learn the five sets of exercises. Many Western tourists also learned the exercises at the festival. Ashras from Iran (right) learns the exercises. She had come to Toronto to visit her son. She told her son that she really liked the exercises and wanted to join the local exercise site. Maryam and her mother Bhnaz learned the exercises. Maryam had signed a Falun Gong petition in London, and written to her parliament member asking for help to stop the persecution. “I love the exercises. I can feel the energy,” she said. Her mother also said she planned to keep practicing. Hanniel, a Toronto resident, could not believe that the persecution is still going on. “We must let more people know about it and help to stop the persecution,” he said. A festival organizer came to practitioners’ booth and said: “Falun Dafa is good.” She asked for Falun Gong materials in English and Chinese for her friends. (Minghui.org) The 17th World Falun Dafa Day and the 24th anniversary of Falun Dafa’s pubilc introduction in China on May 13 is also the 65th birthday of Mr. Li Hongzhi, the founder of Falun Dafa. Practitioners in Toronto, Canada gathered at Nathan Phillips Square on May 3 to celebrate this special occasion. Chrisy Trudeau, a nurse working in Toronto, said Falun Dafa improved her life in the best way. Her dietary and digestive problems that could not be cured, as well as her marijuana addiction, were gone several weeks after she began to practice Falun Dafa. Alice Huang is a teacher who used to suffer from arthritis. Because of the pain, she had difficulty writing and typing on a computer. To prevent further edema, she had to receive injections every week and had a restricted diet. She saw practitioners doing the Falun Dafa exercises at a park one day and decided to give it a try. Joey Giglioti, 24, joined the World Falun Dafa Day festivities for the first time. He traveled for an hour from Hamilton to reach the event. He said he first heard about Falun Dafa from a friend one and half years ago. “I had always been searching for a way to make me a better person. Then I found Falun Dafa. I am very fortunate, because Falun Dafa is the best in the world,” he smiled. Group exercises at Nathan Phillips Square. Joey Giglioti joins the World Falun Dafa Day celebration for the first time. Toronto resident Adriana Reasner and her husband were impressed by the practitioners’ group exercise as they walked past the square. “We have seen many activities in Toronto before, but it is hard to find one so peaceful,” she said. Seeing a banner from practitioners with the words of “Truthfulness- Compassion-Forbearance,” Adriana turned to her husband with excitement. “This must be good. These principles are important to this city and the world,” she said. Jordan, a college student majoring in psychology, said he felt strong energy while learning to do the Falun Dafa exercises. “It makes you feel comfortable and relaxed,” he said. Jordan (left) and his friends learn the Falun Dafa exercises. Jimmy Ferbances from Dubai works for a media company in Toronto. He commented, “Wow! These exercises are really amazing.” He then asked many questions such as physical and spiritual benefits, as well as how to get started on the meditation. Upon hearing that the practice is being persecuted in China, Jimmy was surprised. He took a copy of Minghui International and other materials to read more about it. Ray Jonkowski, a financial adviser working in Toronto, was shocked to learn of the Chinese regime’s harvesting of organs from living Falun Dafa practitioners. He added that, while many people and organizations are aware of the human rights violations against Falun Dafa practitioners in China, very few are taking action because of financial interests. “This is wrong. The situation is much worse than what we had thought. Everyone should help stop the persecution,” he said. Carol Jolin, who works for a French-language labor organization, said the Chinese government must take action to stop this atrocity, because freedom of belief is a basic right for all citizens. James works for the municipal government and has heard about the organ harvesting crimes from the documentary Human Harvest, when it was played on the Canadian national television CBC last year. “I’m glad to see so many people here today. I hope they can learn more about the persecution like me, so it can end sooner,” he remarked. (Minghui.org) A petition signed by 20,000 Toronto residents was sent to the Chinese Supreme Procuratorate on February 22, calling for an investigation into the crimes committed by former head of the Chinese Communist Party Jiang Zemin in the persecution of Falun Gong. That same day, local Falun Gong practitioners held a demonstration at the intersection of St. George and Bloor Streets, close to the Chinese consulate, in support of the lawsuits being filed against Jiang. It was an opportunity to tell the public what role Jiang has played in the persecution. Practitioners in Toronto have regularly held similar events since last October, and successfully collected 20,000 signatures of support. Practitioners’ banners in Toronto show support for the lawsuits against Jiang. Toronto residents sign the petition in support of Falun Gong’s peaceful resistance. From May 2015 to today, 205,000 Falun Gong practitioners have filed 173,000 lawsuits against Jiang Zemin for launching and directing the persecution of Falun Gong in China. More and more people all over the world have joined the campaign to support their efforts. In Asia alone, more than a million people have signed the petition calling for Jiang to be brought to justice. Margaret Dinsdale, a local writer in Toronto, talked to practitioners for a long time at the event on February 22. She had heard about the state-sanctioned organ harvesting from Falun Gong practitioners, which shocked her a few years ago, and made her look for more information about Falun Gong and the persecution. Margaret Dinsdale, a writer in Toronto, believes that it is important for more people to be aware of the human rights violations taking place in China. “Persecution is definitely wrong and should be stopped immediately,” she said. Ms. Dinsdale was glad to see the banners denouncing forced organ harvesting at the event. “I am writing a book on this topic,” she said. “I want to draw the public’s attention to this. When more people know about it, they will take action to stop such a brutal crime. She wished practitioners the best of luck filing lawsuits against Jiang Zemin. Seventy-year-old Pedro, a local artist, read all the banners at the event and said he knew about the persecution. “The new Canadian government should not ignore this. We must, the whole world must, do something to end the persecution and help to bring Jiang Zemin to justice,” he said. Pedro himself is learning the Falun Gong exercises. “The government should promote such a good practice, instead of suppressing it,” he believes. Pedro encouraged practitioners to hold more events like this, so that more people will be informed about the persecution. Gwen Macgregor, a PhD candidate at the University of Toronto, signed in support of Falun Gong’s lawsuits. “It is incredible that the Chinese government persecutes such a peaceful cultivation group,” she said. Stamistan Gulegsky, a student from Ukraine, said that the instigators of the persecution should be brought to justice. (Minghui.org) Local Falun Gong practitioners organized a “Great Wall of Truth” event in Chinatown in downtown Toronto on December 28. Banners reading “Happy New Year” and “Support 200,000 Chinese Suing Jiang Zemin” were held high and passers-by stopped their hurried steps to learn more. Many signed a petition demanding an immediate end to organ harvesting atrocities involving jailed Falun Gong practitioners. The petition also supported the lawsuits against former Chinese dictator Jiang Zemin. “Great Wall of Truth” event in Chinatown at downtown Toronto on December 28, 2015. A banner promotes Nine Commentaries on the Communist Party. Mr. Zhu and his wife brought their child to the event despite the cold weather. “We come here to let more people know about Falun Gong, and the truth about the persecution of Falun Gong in China,” said the wife. She talked about how the Party controls the media in China and even most Chinese language media in other countries as well. She said that these media still spread lies defaming Falun Gong and hopes that the public will not be deceived by Party propaganda. Sam, a civil engineer of Toronto. “The Chinese Communist Party is crazy! We must put Jiang Zemin on trial,” said Sam, a civil engineer. He signed the petition and thanked practitioners for their efforts. 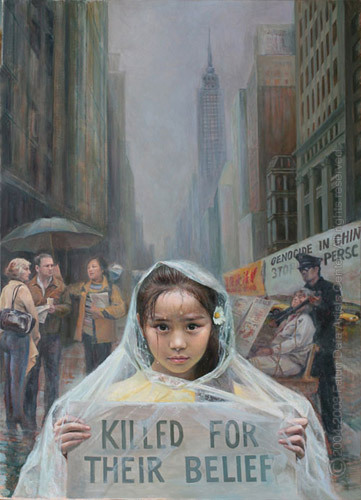 “It is so sad to know that Falun Gong had their organs forcefully taken. I support your activities to end the persecution,” said Juliana, a resident of Toronto. Jessie Herb (left) and friends from Millersville University in Pennsylvania. Jessie Herb, a college student from Millersville University in Pennsylvania, commented that the lawsuits against Jiang Zemin are a positive step toward justice. “I support you!” He said while signing the petition. (Minghui.org) Falun Gong practitioners were a big part of several major Christmas parades in North America this past weekend, fielding the magnificent Divine Land Marching Band, waist drummers, and practitioners demonstrating the Falun Gong exercises in colorful, traditional dress. Falun Gong featured in two events in the Toronto area on November 28 and 29, and one in Sherbrooke near Montreal on November 29. Also on November 29, practitioners took part in the Hollywood Christmas Parade. With the Divine Land Marching Band and waist drum troupe, Falun Gong practitioners attended two Santa Claus Parades near Toronto: Markham in the north on November 28 and Mississauga in the west on November 29. The Divine Land Marching Band on parade in Mississauga. Waist drum performance in the Markham Santa Claus Parade. Lucie Muldoon, organizer of the Mississauga parade, said that she always enjoys the practitioners’ performance and is glad to invite them every year. “”Both the band and waist drums have been doing so well. The music is absolutely beautiful! The color is great too. It brights up everything and is a perfect fit for the parade,” she enthused. Event organizer Lucie Muldoon said that she always welcomes Falun Gong to the Mississauga Christmas Parade. Many Chinese spectators chatted with the practitioners. After learning more about Falun Gong and realizing that the Chinese Communist Party (CCP) had been defaming practitioners for over 10 years, a large number of Chinese people decided to quit the CCP and its affiliated organization. Danijela Matteo from Mississauga said that practitioners in China should have the right to practice their belief. She was glad that Jiang Zemin is being sued for persecuting Falun Gong in China, “He did something terribly wrong and he should be responsible for that,” said Ms. Matteo. After the Montreal parade on November 21, practitioners traveled about two hours to take part in the 14th annual Sherbrooke Santa Claus Parade on November 29. With practitioners from New York, Ottawa, and Montreal, the Divine Land Marching Band was the biggest participating group and was invited by the organizer to lead the parade. All the way from the city center to the Place des Festivals in front of City Hall, the band received waves of warm applause from the spectators. Réal Sirois, who played in a marching band before retirement, was very impressed. “This is really outstanding! It would be hard to find another band so good,” he said. The Divine Land Marching Band and a light snow set the holiday mood for the Christmas parade in Sherbrooke. There were about 100 groups in the Hollywood Christmas Parade on November 29, an annual event that began in 1928. With its cultural diversity and groups from overseas, this celebration always draws a big crowd. Falun Gong practitioners have been invited back to the Hollywood Christmas Parade every year since their inaugural performance in 2005. Their presence has added a special flavor of Oriental culture to the festivities. The Divine Land Marching Band at the Hollywood Christmas parade. Falun Gong float in the Hollywood Christmas parade.